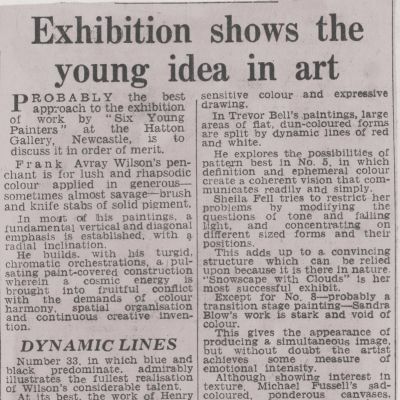 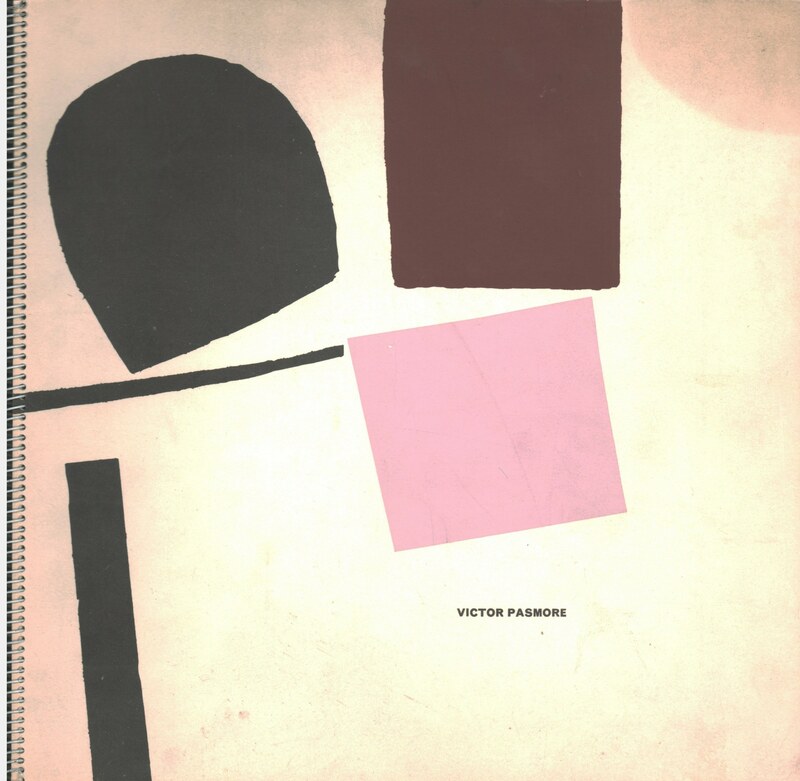 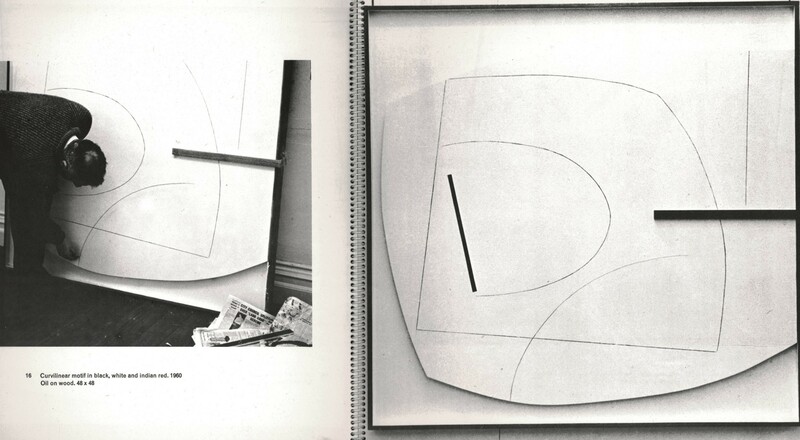 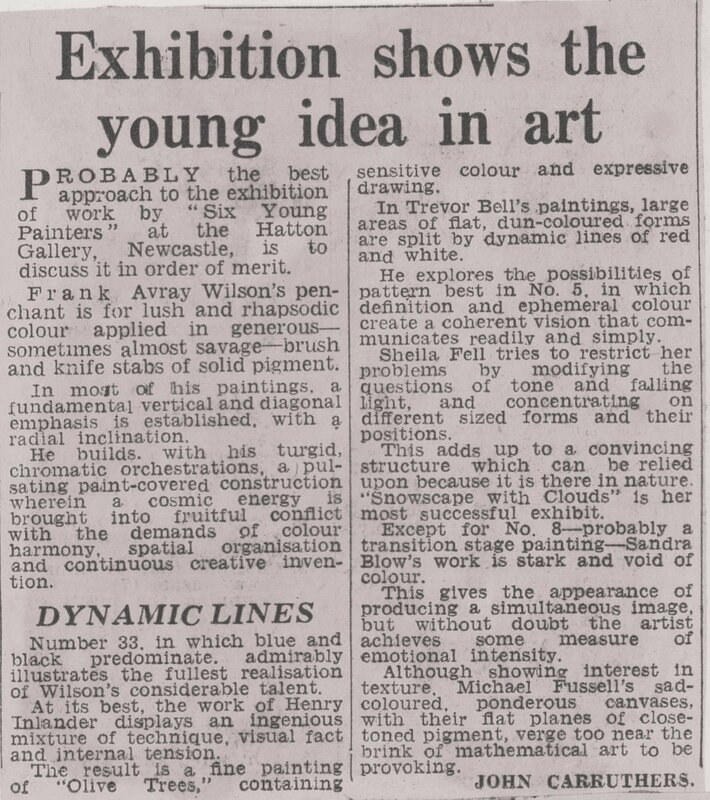 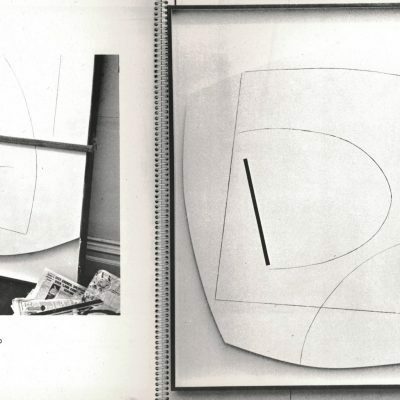 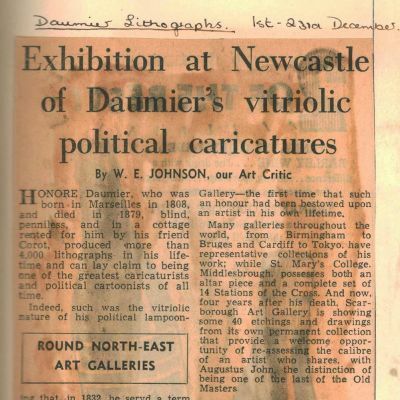 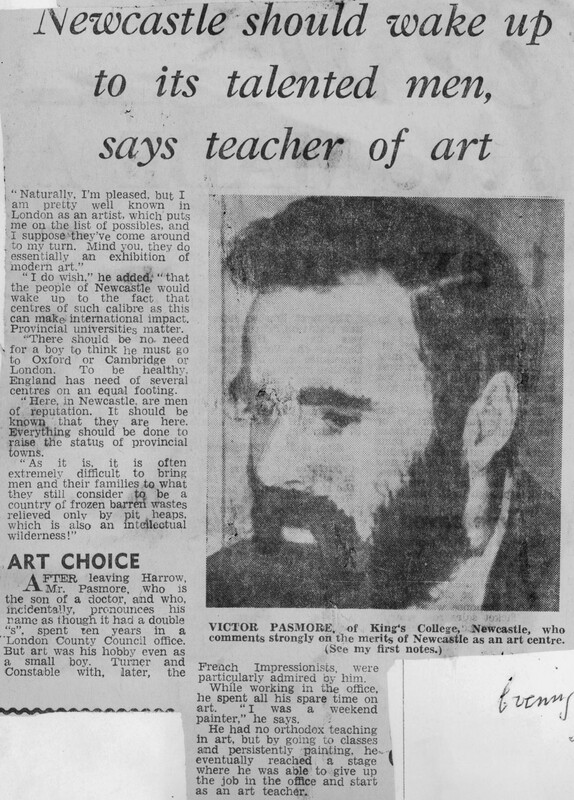 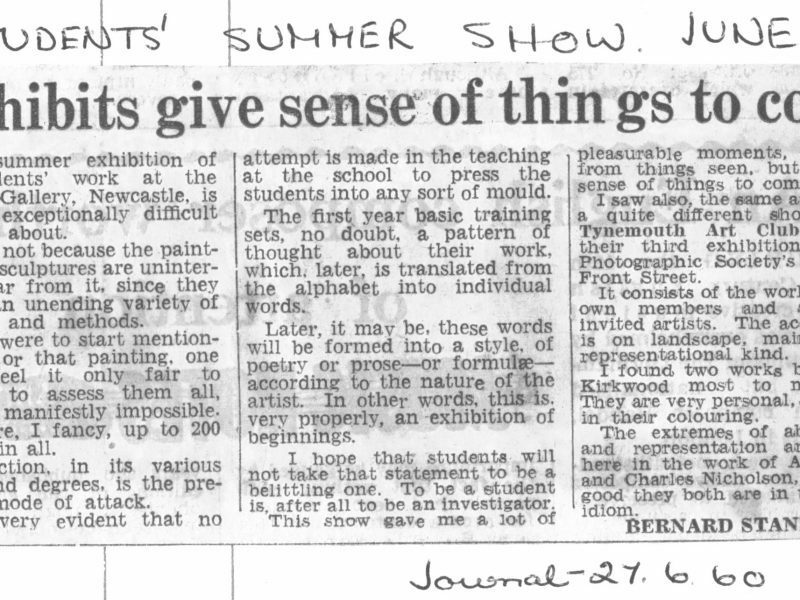 With Kenneth Rowntree suceeding Gowing as Professor and following Pasmore’s departure in 1961, this decade saw the increasing influence of Richard Hamilton in teaching, more emphasis on British 20th century acquisitions and younger contemporary artists’ exhibitions. 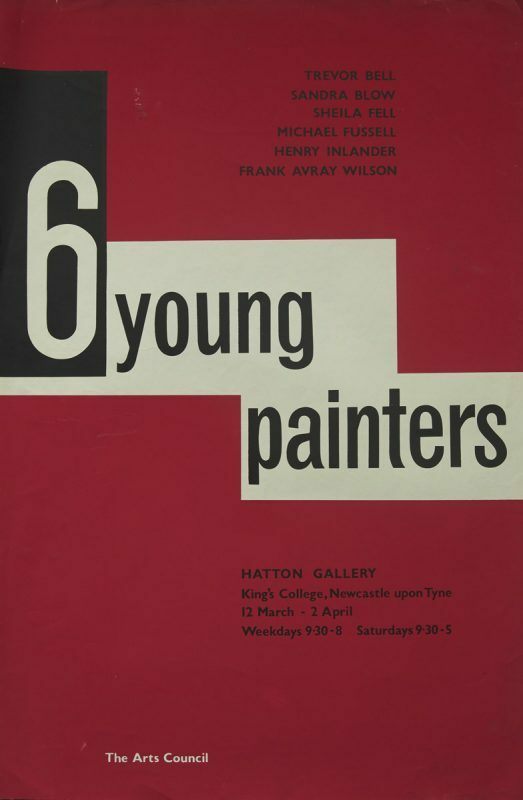 While Evetts, McCheyne, Holland and Hodgson remained on the staff, others such as Geoffrey Dudley, Eric Dobson, Derwent Wise and later Ian Stephenson took prominent roles. 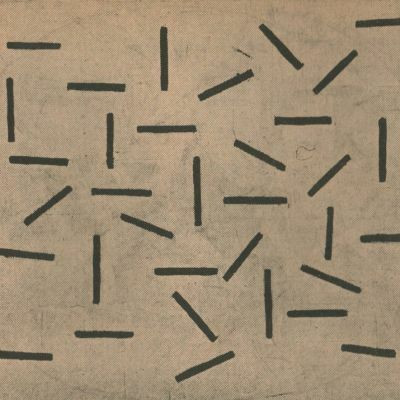 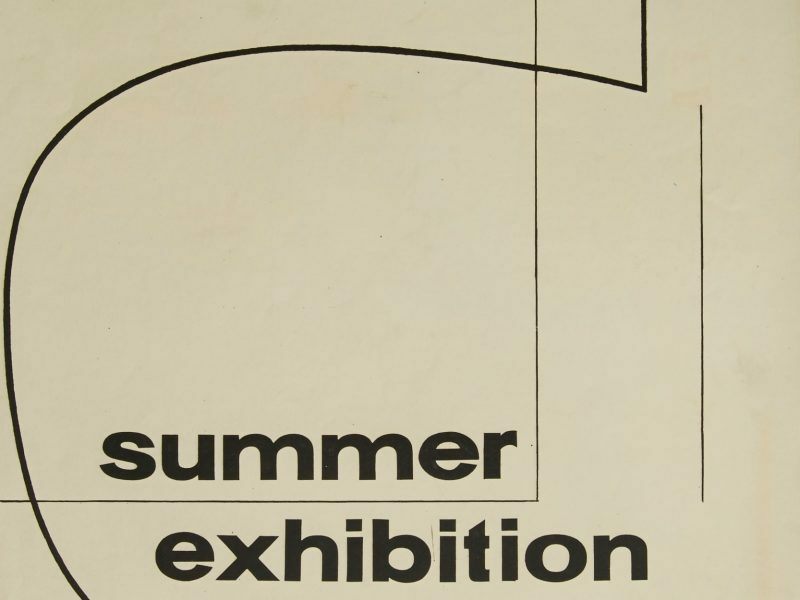 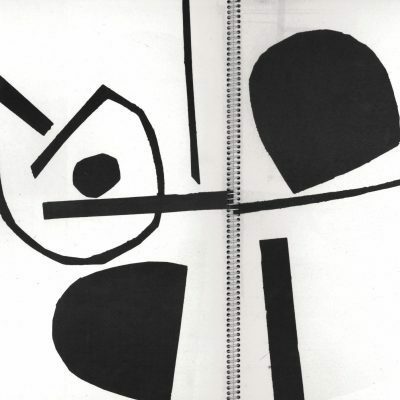 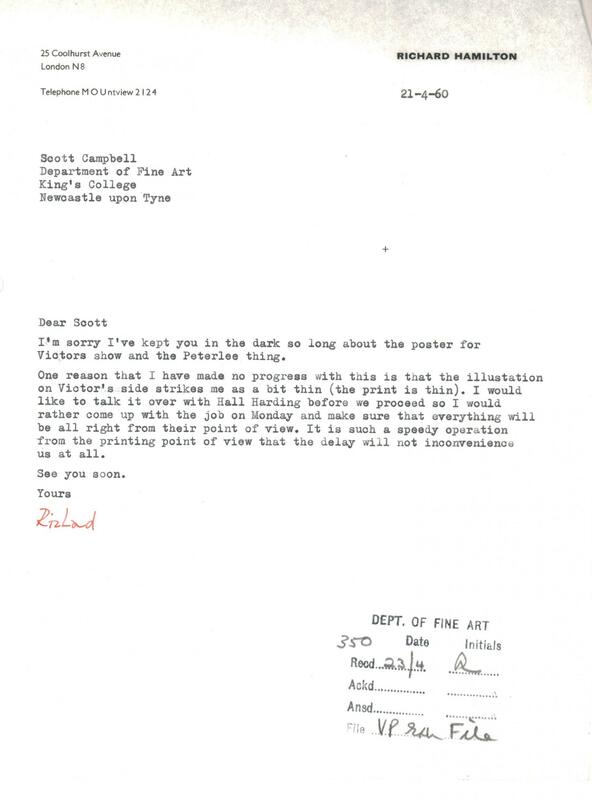 The poster for the 1960 Student Summer Exhibition is one of the most minimal in its arrangement of just a few lines around the bare essential text. 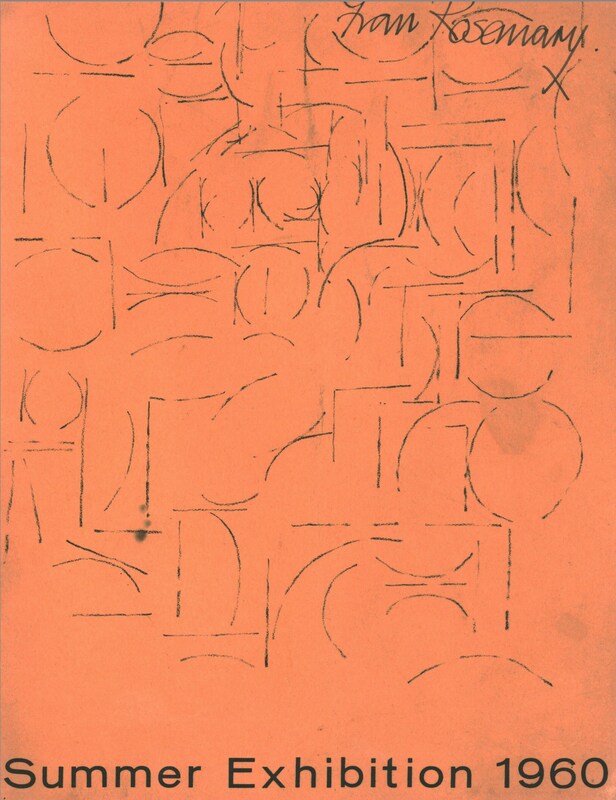 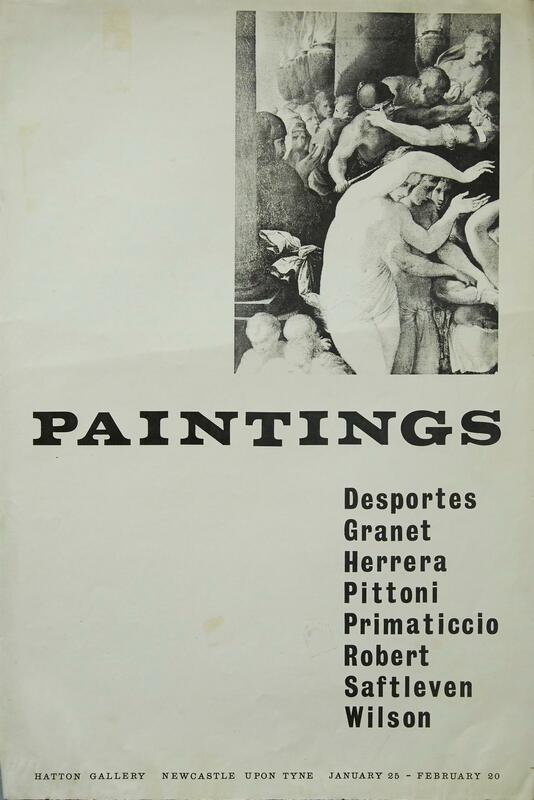 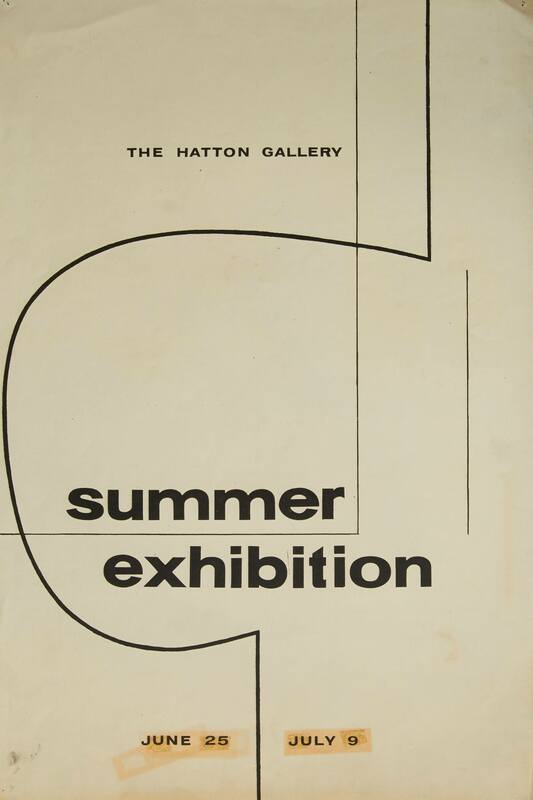 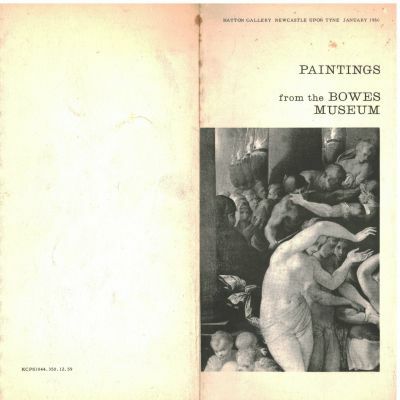 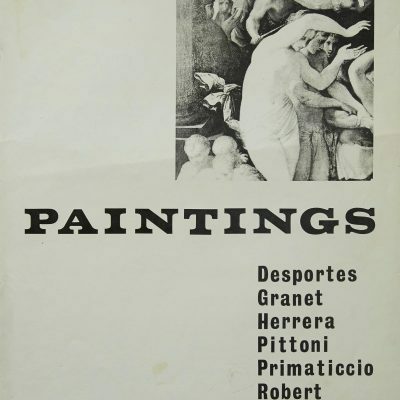 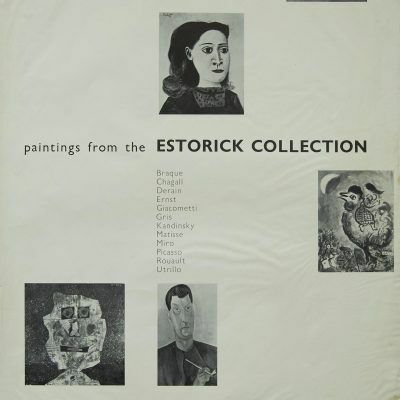 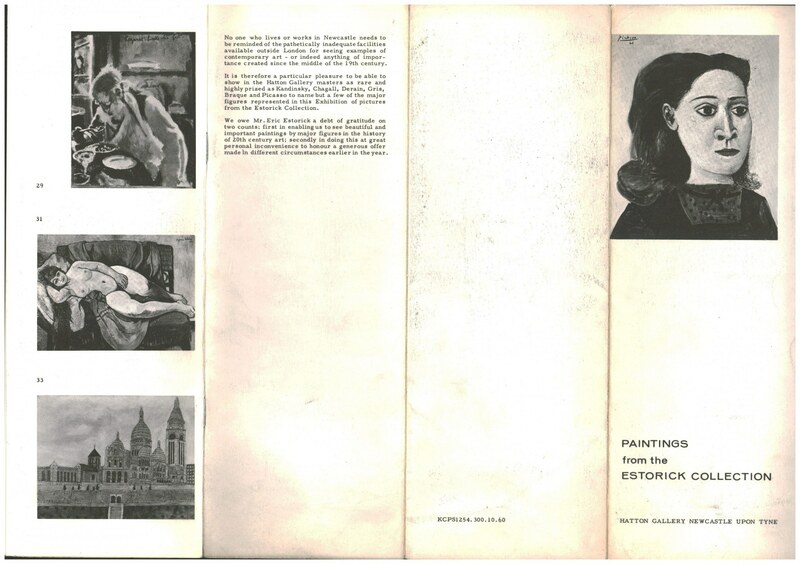 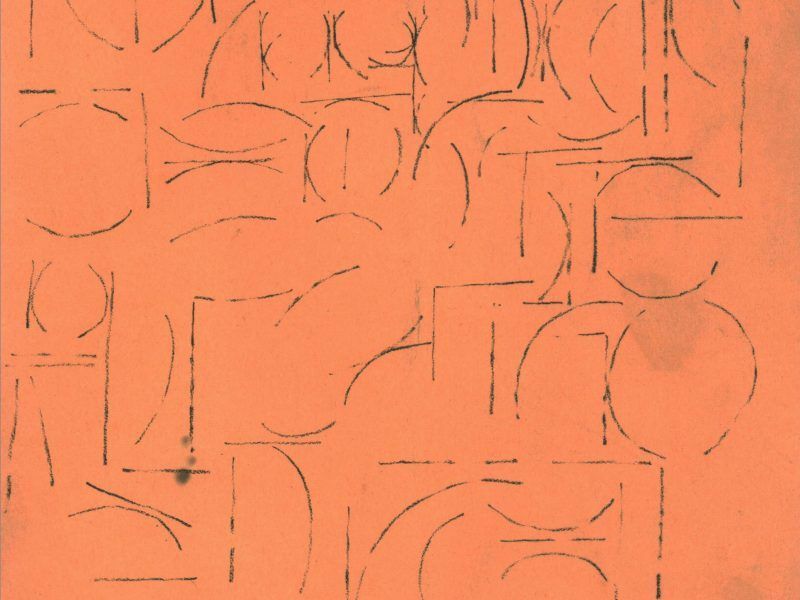 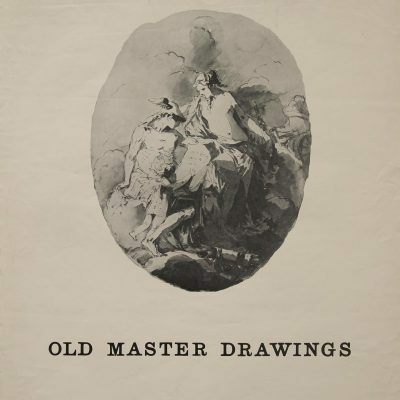 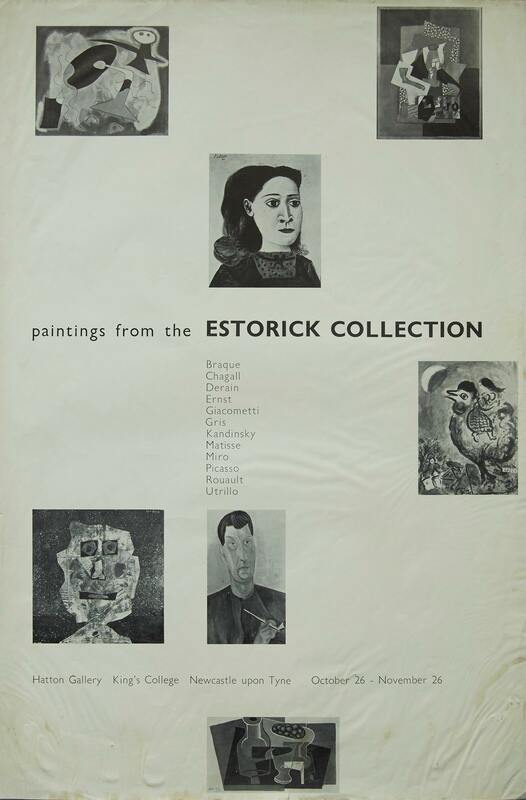 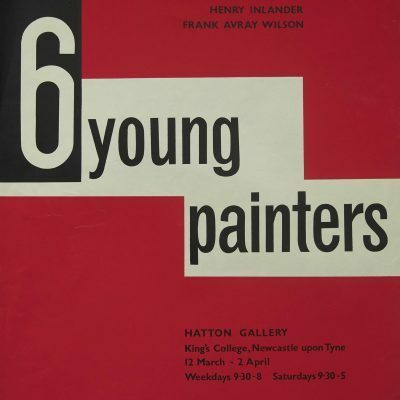 The 1960 Summer Exhibition catalogue returned to having a student designed cover, like 1958 this looks like an example of a ‘basic course’ exercise. 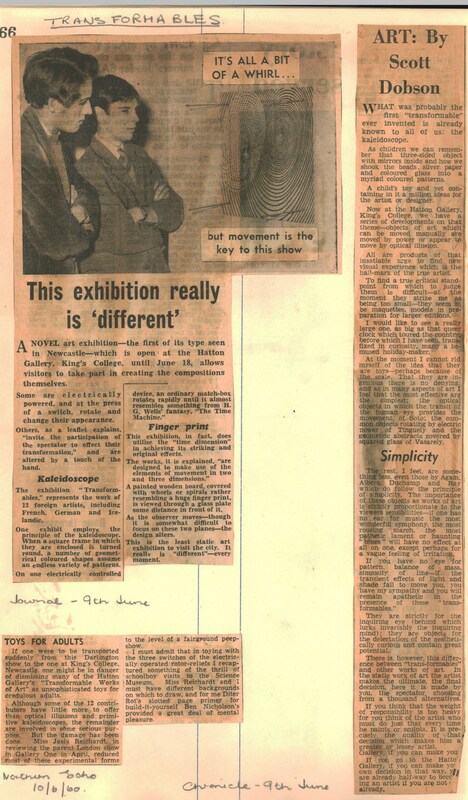 In 1960 the external examiners were Claude Rogers and Willi Soukop. 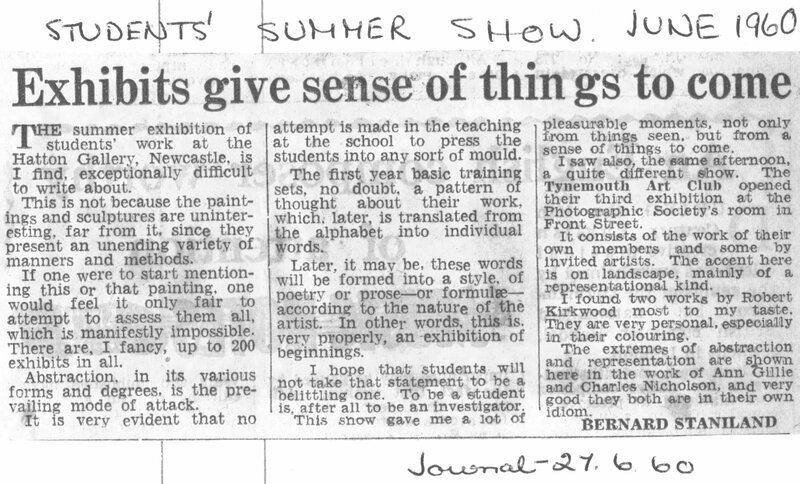 Bernard Staniland’s positive review from The Journal. 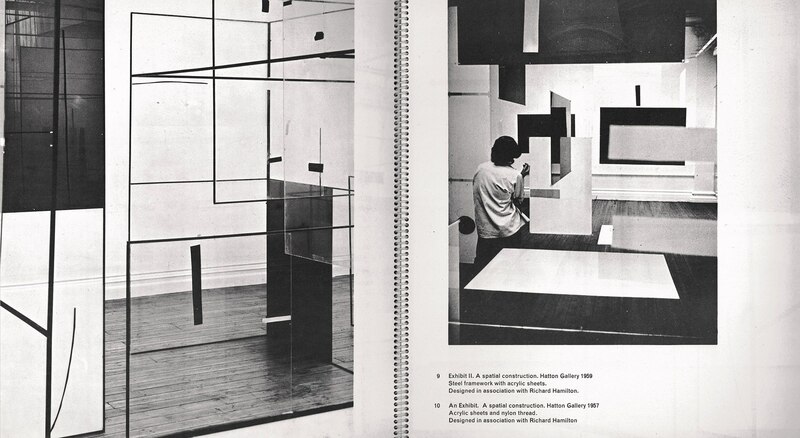 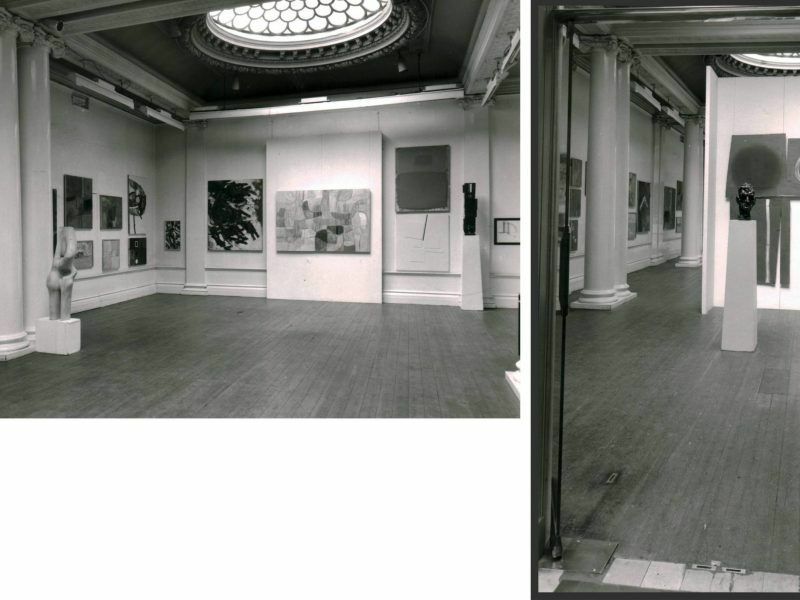 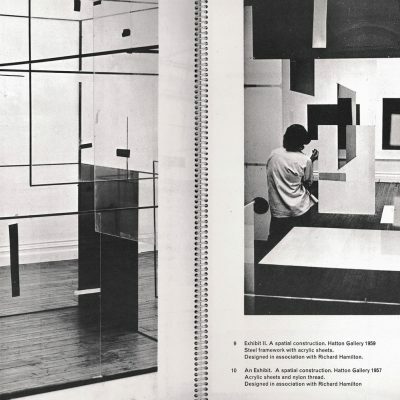 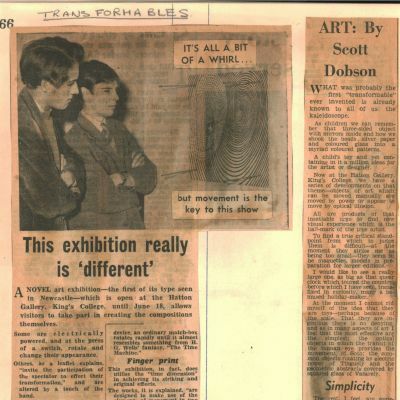 Installation views of the 1960 student exhibition in the Hatton Gallery. 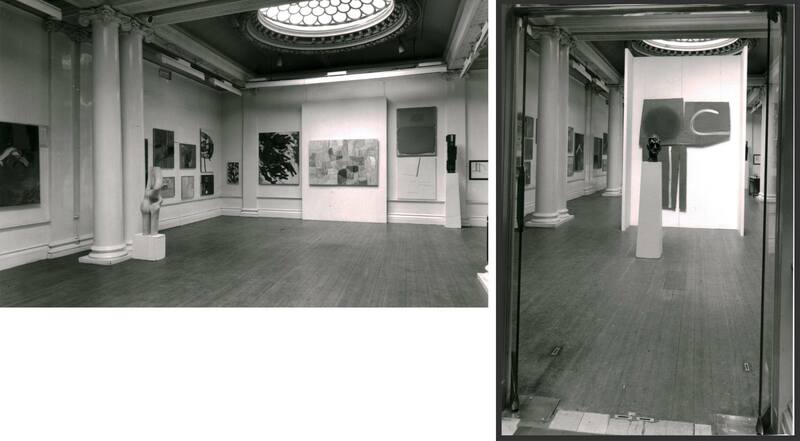 Like for much of the 1950s and 60s, the bay window at the end of the front gallery (to the left of the skylight in this picture) was blocked off with a false wall to increase the amount of hanging space. 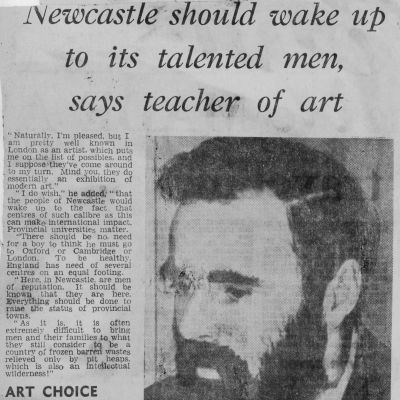 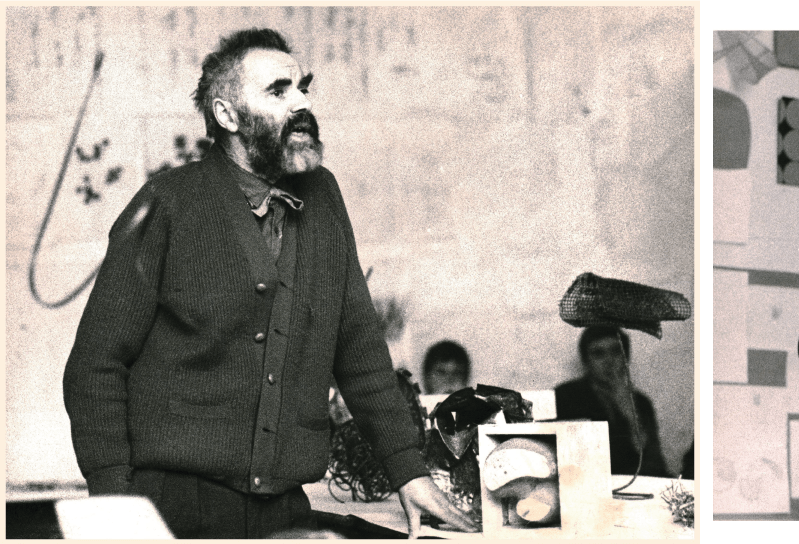 These images of Pasmore teaching in Newcastle demonstrate the importance that was placed on the sharing of the outcomes of undertaking specific exercises. 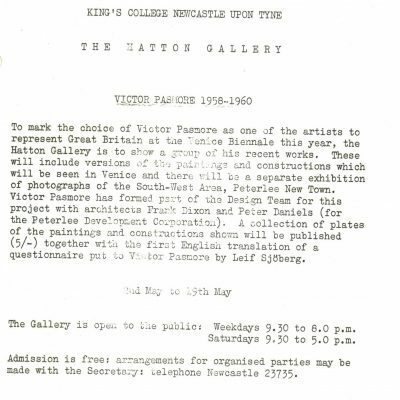 Works were pinned up or displayed together on benches, and in the ensuing ‘crit’ tutors and students would discuss the various results. Alan Davie (1920-2014) - 'Yellow Pool Pull' 1959. 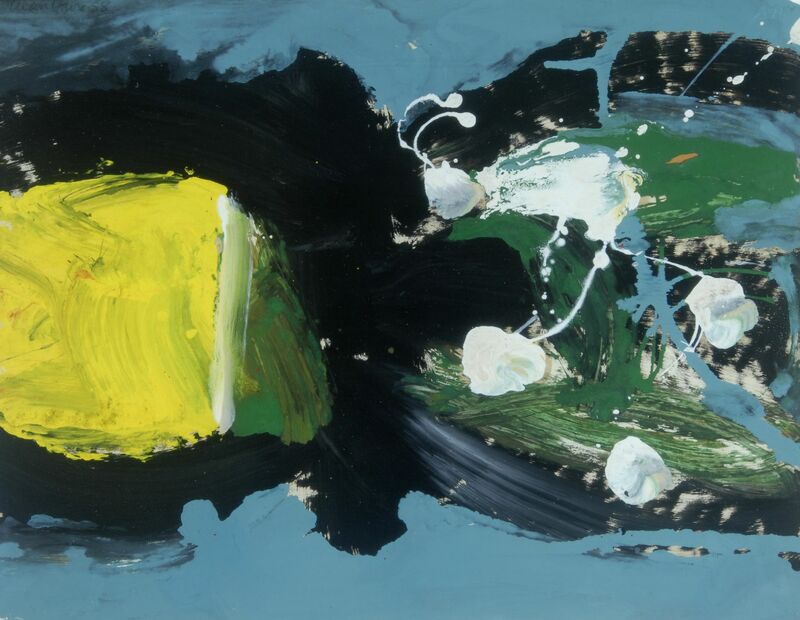 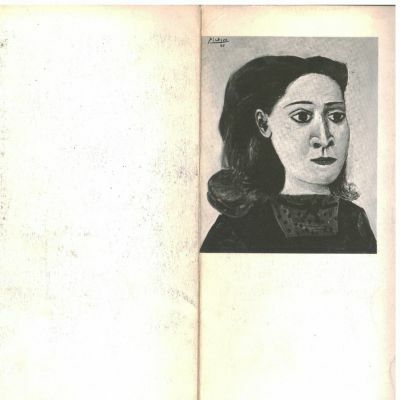 NEWHG : 2011.2 Oil on paper purchased from Gimpel Fils, 1960. 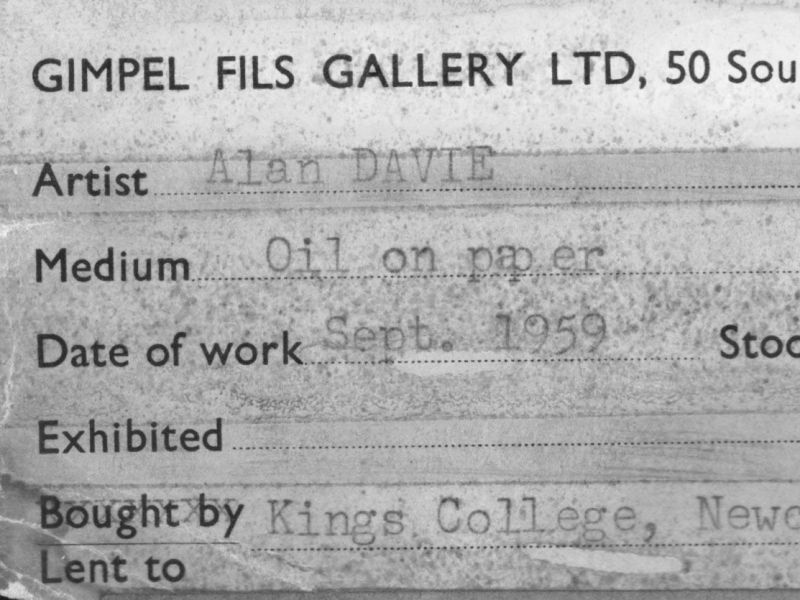 It was unusual for such a ‘new’ (this painting label confirms it was just a few months old) work as this Alan Davie to be acquired for the Collection, in this case direct from the dealer, Gimpel Fils. 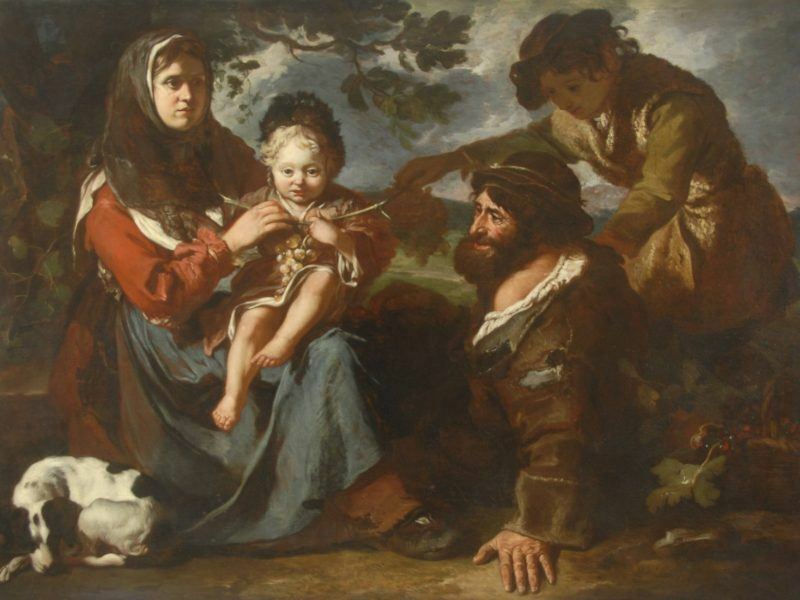 Antonio Amorosi (1660-1738) - 'Peasant Family', c.1700-1730. 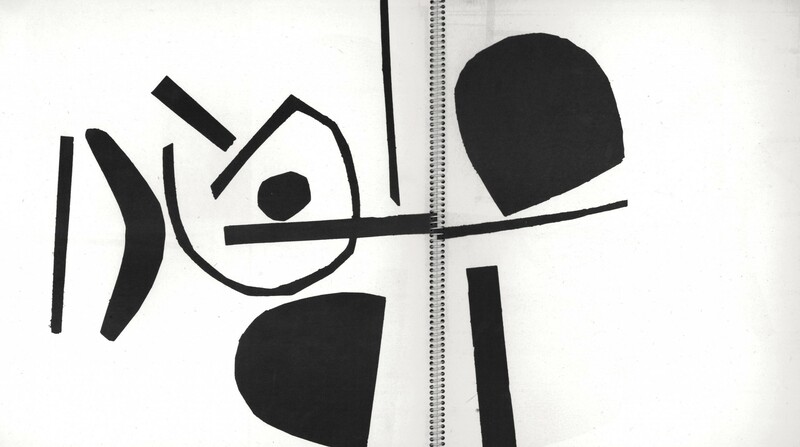 NEWHG : OP.0069. 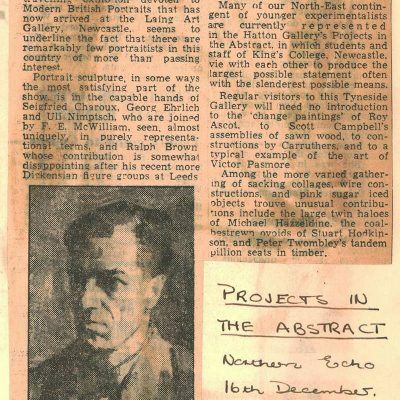 Oil painting purchased from Christie's, 1960. 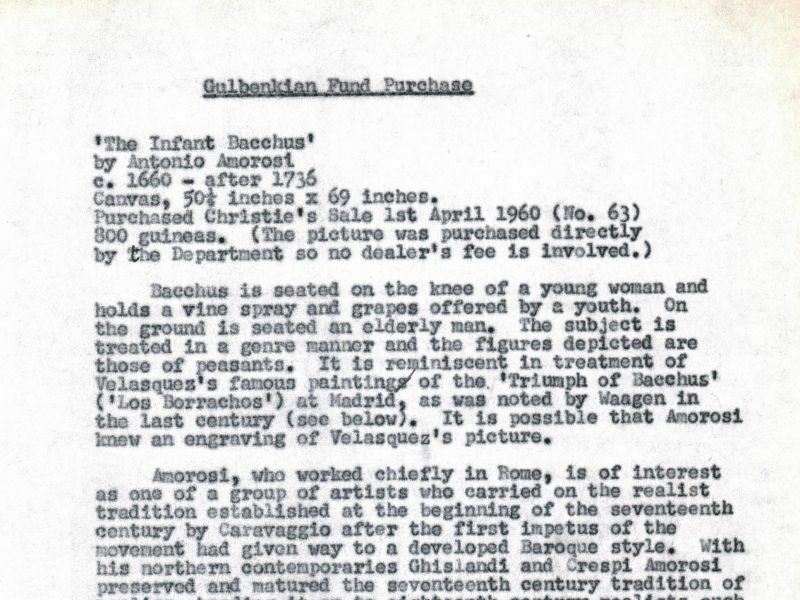 The Amorosi was one of the first works Rowntree acquired with the funds Gowing had secured from the Gulbenkian Fund. 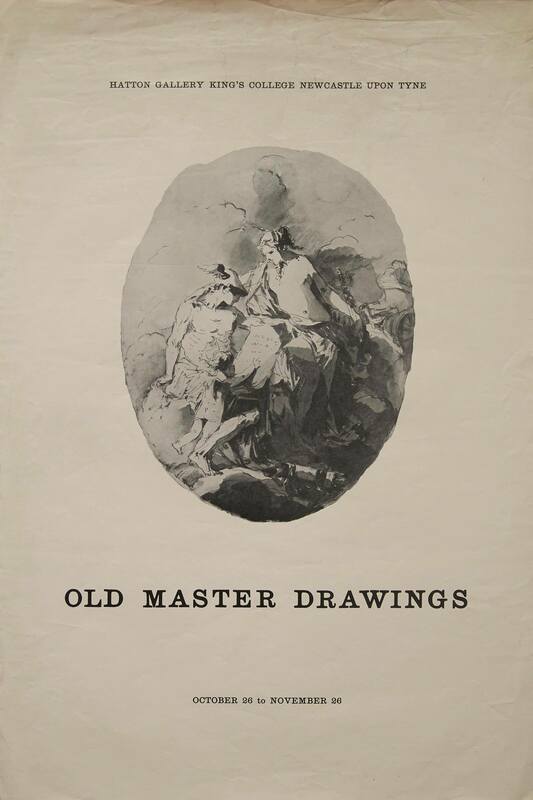 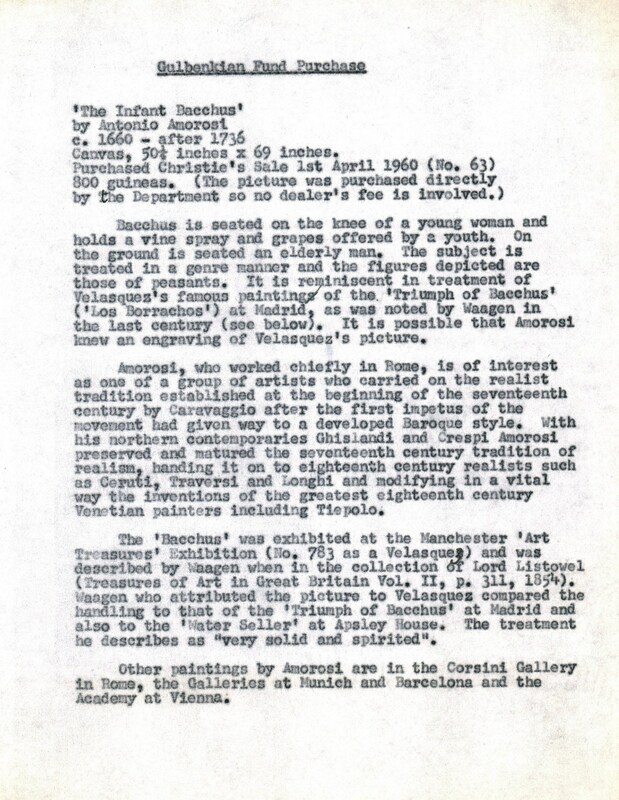 Ralph Holland produced this catalogue summary sheet describing the work and its attribution. 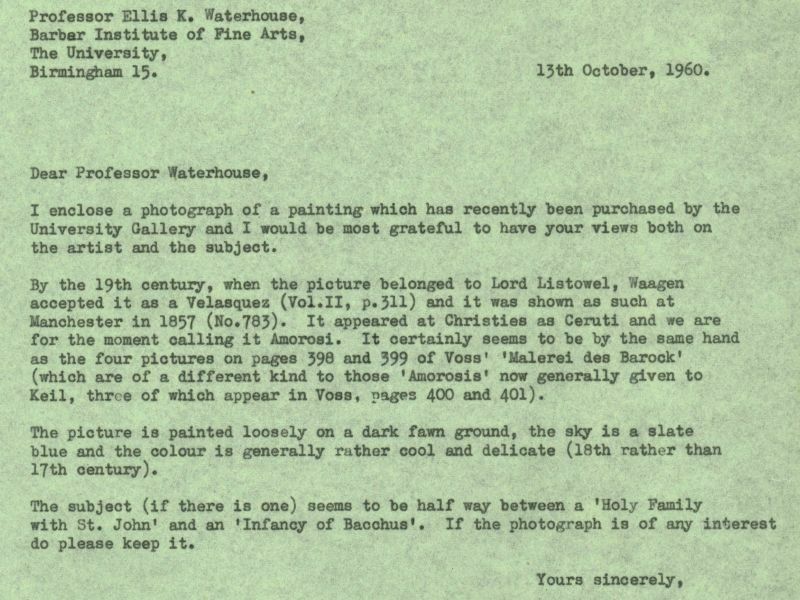 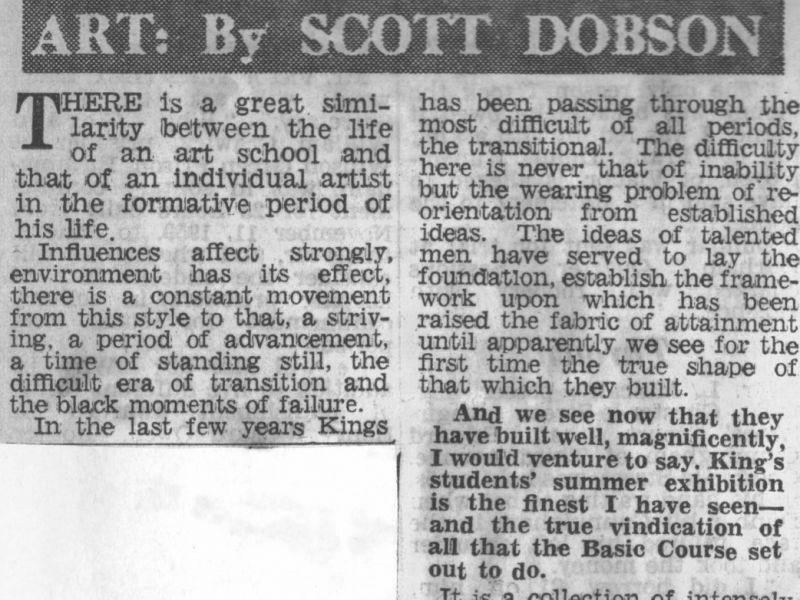 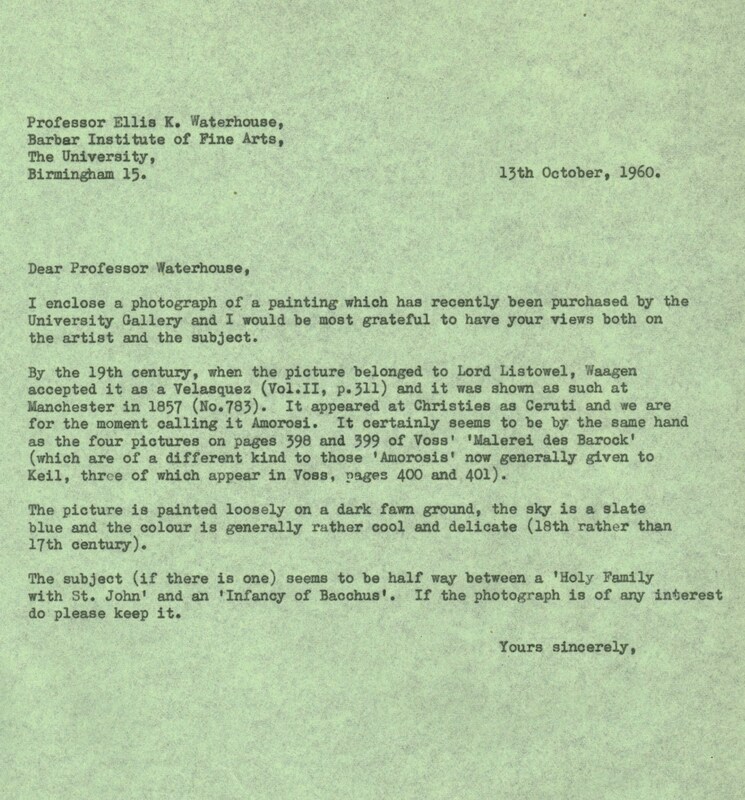 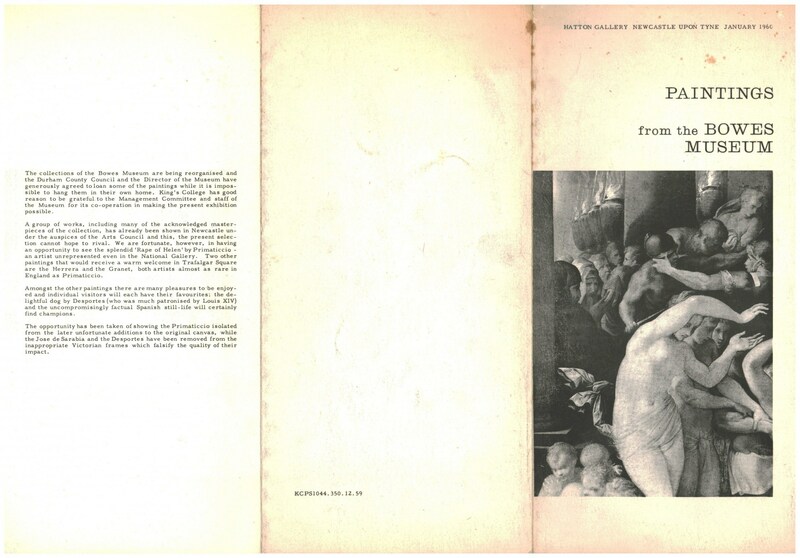 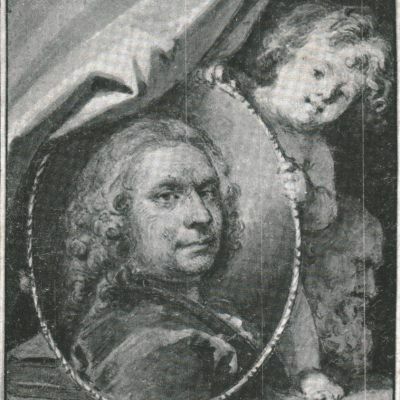 On acquisition Rowntree wrote to the Barber Institute’s Professor Ellis Waterhouse, former Director of the National Galleries of Scotland and an expert in Italian Baroque painting, asking his opinion on the Amorosi.